This chandelier, Tide, is made from colourless plastic artefacts found along the coastline of the UK during a 500 mile walk by the artist. The spherical form of the chandelier refers to the moon as a light source, as opposed to more traditional references to the sun. Central to the concept, production, and materials in this piece is the moon, as it controls the tide and causes the plastic to wash ashore, which Haygarth then collects and arranges to create the form. The cyclical nature of the tide and the moon is reflected in the loop of co-dependent production, ideas and materials. Haygarth's fascination with taxonomy (the categorisation of objects is intended to highlight similarities) has led him to produce this installation which explores tensions and correspondences between natural and manmade beauty. This also relates the work to the role of archiving and collecting within The Collection and Usher Gallery. 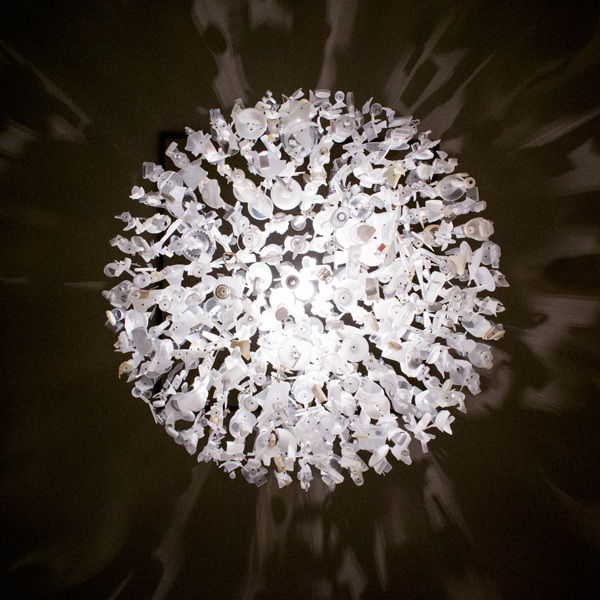 This work took three days to install with each single piece being attached to the chandelier by hand. The chandelier, Tide, hangs in the hall of the Usher Gallery. Elevating the commonplace or discarded object is a central tenant of Haygarth’s work. His exquisite designs and installations have employed the flotsam and jetsam of everyday life – from man made debris wshed up on the seashore to thousands of salvaged prescription spectacles. Creating order and symmetry out of randomness and waste, his work is as much about the process of collecting and collating materials as the elevation of these materials to objects of value or beauty. By constructing narratives about time, loss, abandonment, and modernity, these human aspects attached to the chosen objects are an integral part and driving force within the work. As he has said, ‘My work revolves around everyday objects, often collected in large quantities, categorized and presented in such a way that they are given new meaning. It is about banal and overlooked objects gaining new significance’.